With an oscillating drum, you can follow contours with precision over even the most uneven ground, on flat levels or over slopes. Even if you’re working on a compact site, this genuine Bobcat attachment has got you (and the ground) covered. With its innovative offset drum design, you can roll past curbs, sidewalks, and walls with ease and precision. The jobs you have to do are grueling enough, which is why the comfort of the operator is something that Bobcat always has in mind. With the vibratory roller attachment, they built an isolation mounting system to deter the vibrations from reaching the operator. What this means for you is more energy and comfort. Choose between a smooth or padded drum, based on the type of land you’ll be working with, and enjoy features such as the patented Bob-Tach mounting system, added versatility, drum oscillation and bi-directional operation. 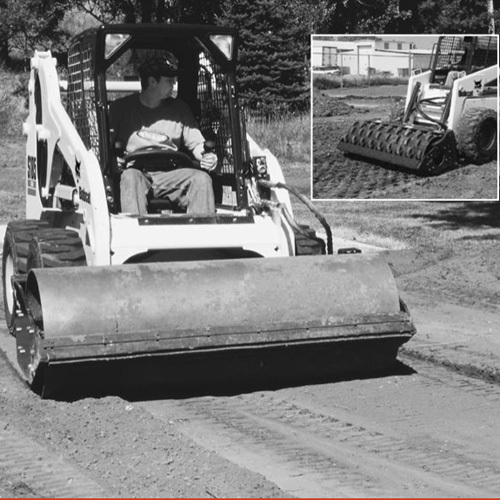 Whether you’ve got a road to pave, landscaping with to do, or a construction site to prepare, the Bobcat vibratory roller is the partner you need to get the toughest jobs done smoothly. You can always count on Bobcat for the most reliable and versatile equipment and world-class service. The vibratory roller hard-packs in either forward or reverse. Oscillation of the drum allows the roller to follow contours on uneven terrain, offering more precise control when operating on slopes. For more compact job sites, the offset drum design allows for operating next to sidewalks, walls and curbs.